Blood is commonly shed where violence has been inflicted. When blood has been shed there is a need to assess it appearance and distribution in the context of the case. Blood Pattern Analysis (BPA) is a historical, well-documented, technique that is robust and scientifically based and can provide a wealth of useful information to a case study. The Scientific Working Group SWG suggested international standards for the discipline that are accepted by the international association of blood pattern analysts (IABPA). PFS Blood Pattern Analysis experts are members of this international group. By evaluating and applying objective criteria to blood patterns it may be possible to identify features that can assist in identifying what happened, where, how, what with and by whom. In addition, by studying the blood shed at the scene it may be possible to determine the extent and type of blood patterns expected on the perpetrator. 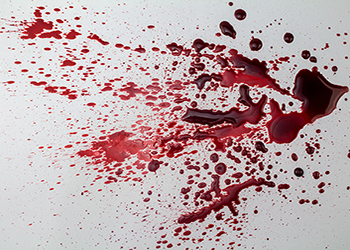 Our Blood Pattern Analysis experts will consider the many factors that affect the complex behavior of blood and evaluate these in the context of each case taking into consideration the allegations, witness statements and the defendant’s account. For example, this might include what occurs when blood is shed, the types of injury sustained, the time span of the event, environmental factors, the actions of both the victim and the assailant, the type of weapon used and fabric effects. PFS BPA experts have extensive experience of performing laboratory-based examinations of weapons and clothing. As highly experienced crime scene examiners they are also able to attend, and review BPA findings relating to scenes, scene photographs and exhibits (at the original laboratory examination site) before formulating detailed peer reviewed reports.